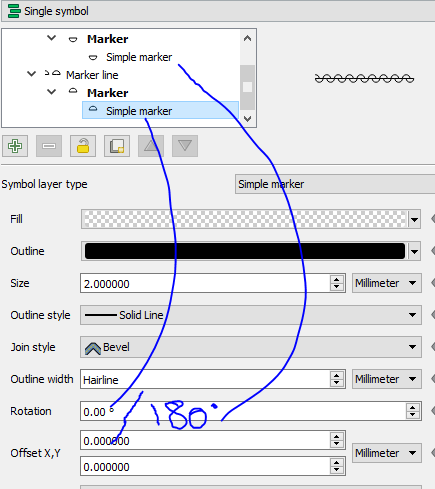 Is there a QGIS function or plugin to draw wiggly line? 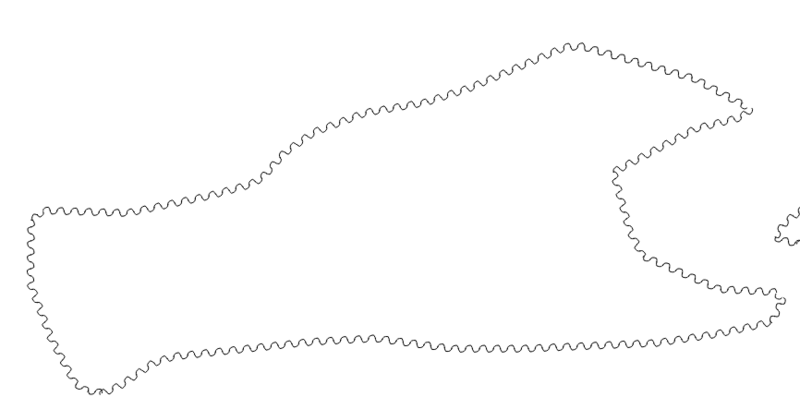 Inkscape Function Plotter ( sin(x) curve). I propose a solution using PyQGIS. It should work both for Linestring and MultiLineString layers. This solution is based on the creation of semicircular rings, so you need to set a value for the diameter (i.e. the step variable in the code below). The step you choose won't be the real step used because it is adjusted on the basis of the line length (but it would be really similar to the value initially set). You need to do some attempts before finding the best value for the step variable. The code also requires a second (optional) parameter (called crv_angle), which helps for decreasing or increasing the curvature for the rings (I performed a few tests for it, so I suggest leaving 45 degrees as default angle since it would lead to real circular rings). Short answer: you can get it using a custom SVG. See bottom of this post for one. I believe it is better to represent it than to modify the line geometry. Should you want to move an edge or do other actions on the geometry, it would be a nightmare to manage if the wiggles are part of the geometry instead of just a representation of a straight line. You can play with the style marker line. There is a way to easily get close to what you need, and with a bit more effort it is likely possible to get it exactly. To get this, you would style the line with two Marker lines. Each Marker line is made of a Simple Marker, the half-circle. The 1st one is rotated by 180. Both are set to transparent. On the Marker line, you instruct one of them to be offset so the two symbols are not drawn in front of each other, but side by side. If you use offest = 1/2 * interval size, the output will be a sinusoidal curve. I suggest you play with the interval size, offset and symbol sizes. 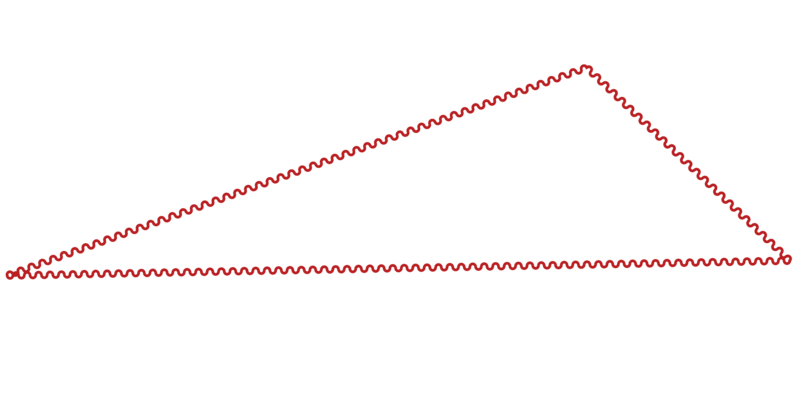 The main limitation with this approach is the diameter line of the half circles, which sums to the original line. If your background is white (or any plain color), you could add a 3rd simple line using the background color. Another option to get rid of the center line is to create a new SVG symbol. I modified the half-curve, only living the rounded part. It works, though a 1/2 ellipse might be more appealing. The screenshot was done using symbol size 10, interval 4, offset 2. <g fill="#ffffff" fill-opacity="0" stroke="#000000" stroke-opacity="1" stroke-width="1" stroke-linecap="square" stroke-linejoin="bevel" transform="matrix(1,0,0,1,0,0)"
Not the answer you're looking for? 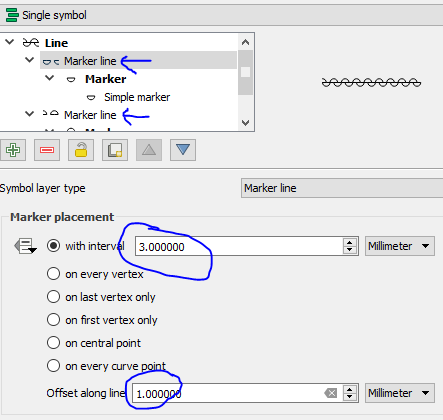 Browse other questions tagged qgis line visualisation linestring or ask your own question. 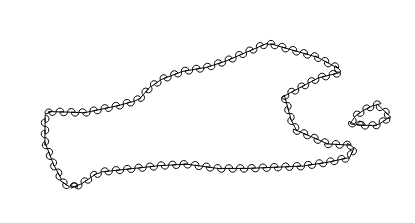 How to draw or edit curved lines in free GIS? 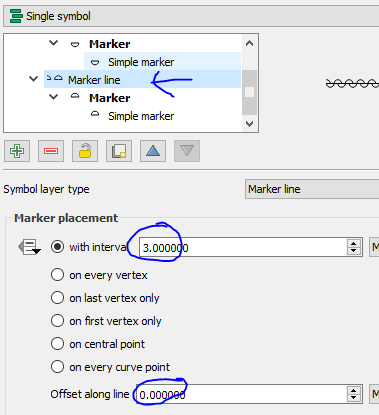 How to merge layers by name in QGIS?